In all the Grand Island lore and trivia, Rod Gartner has his own special place. 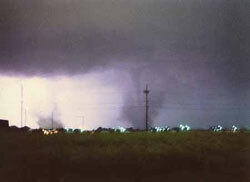 Gartner, now 43, snapped the only photo ever printed of some of the tornadoes that ravaged Grand Island on that fateful night in June 1980. "I was one of the dummies outside with a camera," Gartner said. "That was back before VCRs and camcorders." Today, he said, a similar tornado outbreak might result in dozens of video clips on local and national television. It was the first and last time Gartner has ever seen a tornado. Actually, his photo captured a large twister and an accompanying "sister twister," a spinoff from the bigger one. "It was pretty humid," he recalled. "The only thing I remember is we heard about a storm up by Cairo, and the next thing we knew, the sirens were going off and it was coming our way." It was after sundown, and Gartner remembers all the lightning. "I was standing in my back yard, facing directly north," he said. "All I was doing was watching through my lens, and every time there was a lightning strike, I snapped." Gartner, who caught the two twisters with his 35-millimeter camera, lived on North Johnson Drive at the time, just south of Faidley Avenue and just east of Webb Road. Back then, much of that area was undeveloped. He calculated that the big tornado in the center of his photo was just north of Grand Island Senior High. That area of the city, including the Nebraska Veterans Home, was hard hit. "I saw the sparks flying when the tornado hit the power lines," he recalled. "I figured we were next. But we had no damage at our house. "I saw debris flying around, and it wasn't until later when I realized it was pieces of homes that blew that far away," Gartner said. Gartner's photo was examined by the late Dr. Ted Fujita of Chicago, who developed the Fujita Scale for tornado intensity. "I think he was interested in determining the rotation," Gartner said. Gartner is a native Grand Islander, graduating from Senior High in 1974. He has been employed for more than 20 years at Diamond Engineering, where he is now a shop foreman. Gartner and his wife, Veronica, have five children. They live in Capital Heights, an area of Grand Island that has been struck more than once by tornadoes in the past.